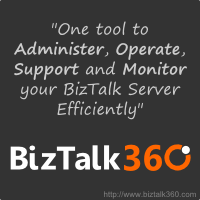 We have a web service we're consuming from within an orchestration in BizTalk. When we add a web reference to this web service from the orchestration we get a web port generated with two operations as expected, one is a request-response and one is a One-Way (send only). However, strangely enough, when we send a message out through the one way port we get a routing failure message in the message box. What happens is that because the web service has a two way web method it is using a two way send port, for both these operations, the expected behaviour is for the SOAP adapter to realise one of the methods is a one way only call and to not expect, or return to the message box a response message. However, as the case appears to be, the SOAP adapter does seem to be returning a message to the message box even when no response was actually received, or indeed expected. is there any way to resolve this behaviour of SOAP Adapter.